There is so much to love about Vegas. My best friend told me about this place called The Container park that was made from recycled truck containers and I didn’t know what to expect. Finally I had to chance to see it for myself with my friends a few weeks ago and was blown away. When I got there I was so impressed with their concept of creating a shopping attraction out of such random materials. The place is practically a work of eco-friendly art and an exciting shopping attraction in downtown Las Vegas that I enjoyed very much. There is an assortment of small boutiques, galleries, bars, eateries and outdoor spaces as well as entertainment and education programming and located in the epicenter of the park is a playground where children can play. Situated on the southeast corner of Fremont and Seventh streets, Downtown Container Park spans approximately 19,000 square feet with a mix of 30 shipping containers and 41 multifunctional modular cubes forming its perimeter. Each cube is a steel-framed structure that measures 250 square feet and can easily form a variety of portable configurations. If Downtown Container Park were ever dismantled, the cubes could be used for other things – such as a construction office or concession stand – and would never wind up in a landfill. How brilliant is that? The sign that stretches above the front entrance is made out of a gray and orange shipping container, and also functions as a bridge — guests can walk through and view all the action on Fremont Street from large window-like cutouts of the letters that spell “C-O-N-T-A-I-N-E-R P-A-R-K.” Even the three-story elevator boasts a shaft that has been fashioned from a shipping container. And how could I forget the amazing praying mantis that blows fire from its head that looks like it came from a burning man convention. I enjoyed browsing through the shops but some stood out more than most. Allow me to give you a virtual tour of the Container Park and the amazing time I had with my friends before we were off to the Neon Museum. We parked a few blocks away and came across this beautiful art deco motel that had so much charm. I had to take a shot of it. My beloved Fremont<3 Art at the front entrance of Container Park. Locks and metal sheets of hearts all personalized with loving thoughts. “Life is short so make it beautiful” The mega praying mantis! Here we go! My bestie Derek and I got to enjoy the day with our friends Daniel and cutie patootie Mila, who is Daniel’s daughter. A cute playing area for kids in the center of the park made of containers. Their own little Container park. First stop, the Big Ern’s BBQ for some grub. I give this place 100 thumbs up for their delicious pulled pork, mashed potatoes, and mac and cheese. Mila and I upstairs about to visit some shops. My favorite shop at the Container Park is Lil Art Bodega because it is full of that NY flavor. It makes me feel like I have a piece of home just by looking at the great artwork they have showcased by some of my friends who are in the graffiti/art scene. Las Vegas doesn’t really have a graffiti culture so we need shops like Art Bodega to spread awareness of this beautiful medium. Canvas’ adorn the walls. They carry some dope apparel too. Stay calm be happy my friends. Buff Monster stickers sold at the Art Bodega vending machine. Some other cool Buff Monster merch. Graffiti greeting cards. Some by my good friend Cope2! Some toys, markers, and other merch kept fresh. Probably the only place in Vegas where you can buy Krink markers. Thug Dunnies. This shop had some cool merch from the Mob Museum we plan to visit soon. So good to see Freemont embracing the art world. I see it becoming the next Wynwood of Art Basel. Winky is a cute shop that had such colorful and unique watches. I loved the colorful decor of the place. Because girls love cupcakes and sparkly things that tell time. 🙂 I want them all. Great customer service too. Boutiqueaholics was another cute shop I came across. Carmen Miranda is what made me come in 😉 Vegas doesn’t have too many fashion forward shops that aren’t so commercial so it was a breath of fresh air to find this one. They had a few pieces I’d like to see hanging in my closet. Cutie Mila blowing bubbles while I browsed through shops. My bestie Derek also relaxing while I browsed. American Vagabond was my favorite apparel shop of the Container Park. It was the most unique of all the clothing shops I browsed through. I’d literally wear anything and everything they had here. Love this hot pink number. Wish you could see the detail of the romper to the right. Such a great piece and it came in neon orange too. The store was super clean and organized. love! I need this varsity in my life. I’ll take the whole rack please. Last stop… The Neon Museum. We love going there to see the old Neon signs! I won’t get into too much detail as I already posted about the Neon Museum here, but I have some cute pictures I wanted to share with you all. Mila’s artistic talent kicked in after seeing the signs. She started drawing in the gravel with her fingers. ❤ Hi! Prettiest grave yard I ever did see. Cutest pug lover I ever did see. 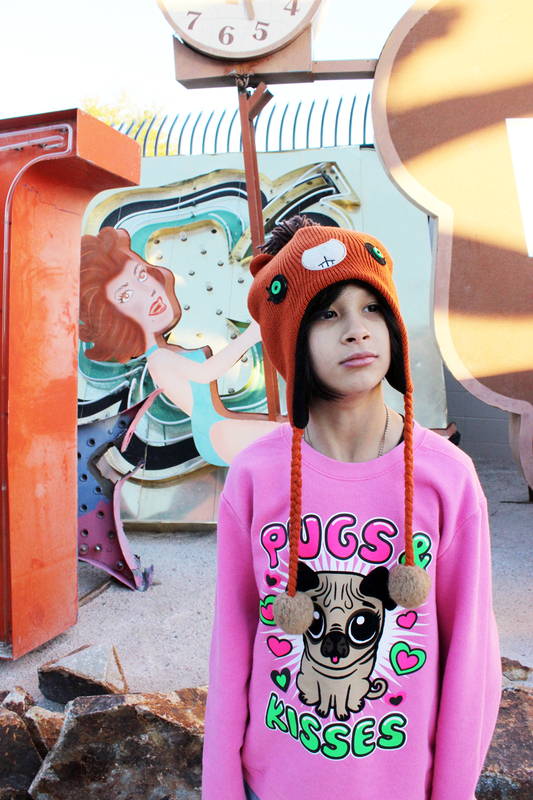 My bestie always loves coming to the Neon Museum. He is always inspired each time. Me and the lil homie :D. She never smiles in photos loll Good times! Visit Downtown Container Park and The Neon Museum if you are ever in Vegas! You will love it! ← Viva las Christmas Eve! Looks like a cool place to visit. Glad you had fun with friends too. Great post! So much to see and do here. I hope we never get tired of it! Fantastic! Thanks! When Johnny Angel and I were there a few weeks ago we were going to check this out! We love the “container philosophy” and plan on creating a container home off grid when we retire! We were walking about at night when I kept hearing the mantis “burn!” We walked that way to see what I was hearing and low and behold… Container Park! They were charging cover at night so we didn’t go in. Will visit it next time during daylight. Great to see your pics of the joint!!! Thank You! Dear Jasmin, I have to say you are awesome, cool, and beautiful. I love that you like my Little Pony, and I do too. Next time I see you I’ll give you a hug and it will be cool.